Here are all the essentials you need to know, from creating a custom audience to specific targeting options, for creating a lookalike audience that expands your advertising reach. Facebook’s massive user base and precise ad targeting options make it an attractive platform for marketers. 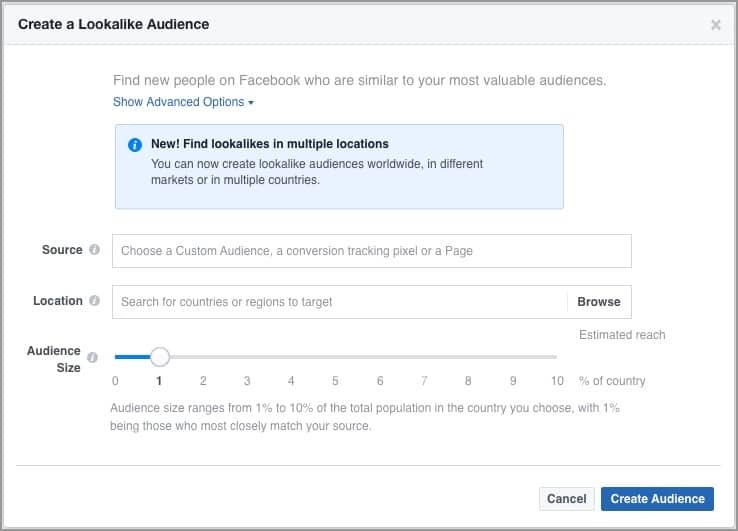 We recently covered four ways to use Facebook’s ad targeting features to make sure your ads are reaching the right audience. 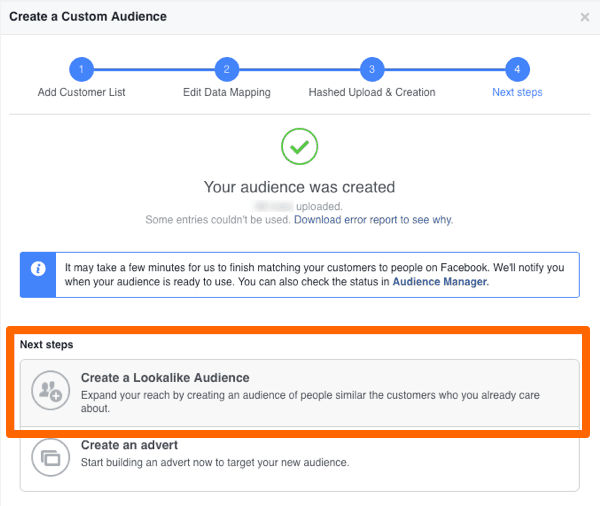 In this post, we’ll be digging into a topic we covered briefly in that post: how to create a Lookalike Audience on Facebook. What is a Facebook Lookalike Audience, Anyway? Lookalike Audiences are one of the best ways marketers can expand the reach of their ads and boost the ROI of their Facebook advertising efforts. But what exactly is a Lookalike Audience? A Lookalike Audience is modeled off of a Custom Audience—a group of customers, website visitors, app users, or Facebook page followers whose contact details you provide to Facebook. Facebook analyzes the users in a Custom Audience and matches their common characteristics with other users to create a brand new group of people you’ve not yet reached but who are similar to your existing audience. Let’s look at a quick example to make things a little clearer. Say you own a company that sells custom-designed sunglasses. You’ve been serving ads to a list of your company’s current e-newsletter subscribers, but you want to reach similar people who haven’t engaged with your business yet. When you prompt Facebook to create a Lookalike Audience based on your email subscriber list, it picks up on that fact that a lot of your subscribers live in sunny locations, like the beach, or that they enjoy being outdoors and tend to be between the ages of 30 and 45. With a puff of algorithmic magic, it identifies other Facebook users with similar interests and demographics and groups them into your new Lookalike Audience. So, how does the Facebook Lookalike algorithm work? When you upload a list of contacts to create a custom audience, Facebook then tries to find those same “hashed IDs” within its own network to find a match. Obviously, not everyone will be matched. Some of your contacts may have used a different email address (i.e. “hashed IDs”) to subscribe to your list then the one they use to login to Facebook, for example. 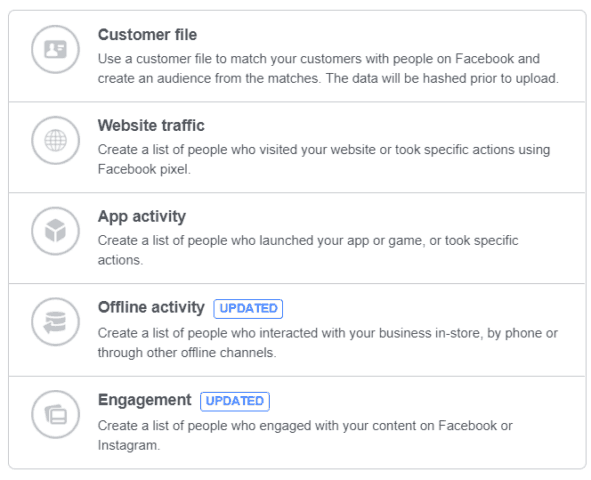 For those contacts that Facebook does find a match for, it then analyzes all of the data points it has of these contacts (location, job, page likes, hobbies, etc.) and cross references this to all other Facebook users within your audience specifications, i.e. geolocation and size. Based on the matching criteria you’ve chosen, it then creates a list of other “lookalike” users, i.e. users that see similarities in key data points. Like we said before, Lookalike Audiences have no life apart from a Custom Audience, so we’ll start there. To create a Custom Audience, go into the Ads Manager and select Audiences from the main menu dropdown. Then click on the Create Audiences option and select Custom Audience. You’ll then be prompted to select a source to use to create your Custom Audience. These sources could be a list of your current customers’ email addresses or phone numbers, mailing lists your import either directly from your MailChimp account or an Excel spreadsheet, or people who’ve engaged with your business on Facebook. You can even select visitors to your website by installing a Facebook pixel. Depending on the source you select, you’ll follow the prompts to complete the data transfer to Facebook to create your Custom Audience. Now that you have a Custom Audience ready to roll, you’re all set to create your Lookalike Audience. Click on the Actions button and select the Create Lookalike option from the dropdown menu. You’ll then be presented with a few choices. Your first one is to select which Custom Audience you’d like to base your Lookalike Audience on (if you’ve created more than one Custom Audience). The next step is to select the country you’d like to target. The last choice is arguably the most important: your audience size. Facebook presents a slider that lets you select 0-10% of the country’s total population you selected above. For a country like the U.S. with a population hovering around 326 million, selecting the 10% option would make for a very large, non-targeted audience. The lower the percentage you choose, the closer the match will be to your original Custom Audience. As a general rule, the lower the percentage, the higher the quality matches you’ll get. Once you’ve made those three selections, hit the Create Audience button and admire your work. Both Custom and Lookalike Audiences give marketers powerful, fine-grained control over who sees their ads on Facebook. Custom Audiences allow for segmentation of existing customers, visitors, and subscribers so you can serve up ads most likely result in a conversion. Lookalike Audiences allow you to exponentially grow your reach by leveraging Facebook’s enormous amount of user data. Want to find out if your targeting strategy is working as well as you expected? Measure your campaign engagement with this Facebook Ads Campaign Analysis Dashboard. 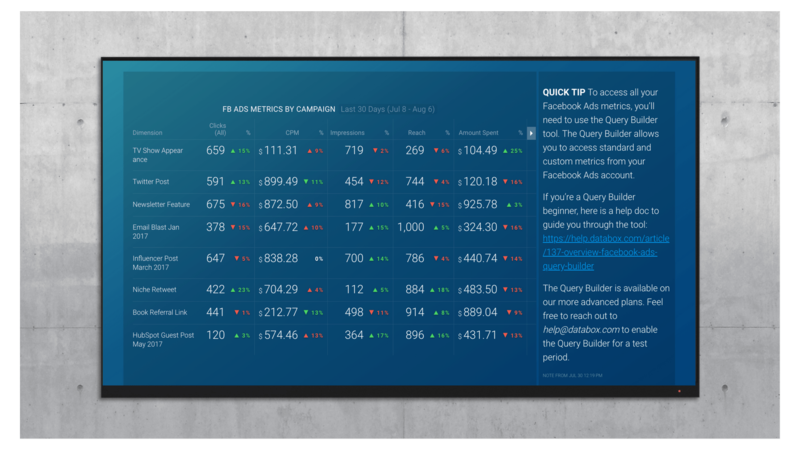 It will help you visualize all of your most important ad campaign KPIs at a glance. 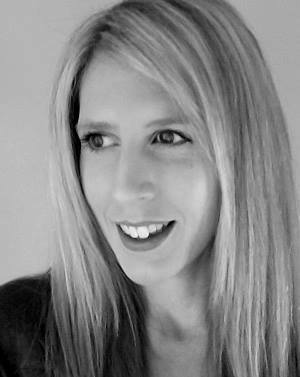 Laura MacPherson Laura MacPherson is a freelance copywriter who helps tech and software companies engage their audiences and communicate their unique value. She's a nerd who loves learning, but she balances her bookishness with a hiking addiction.